I’ve been so grateful to the bloggers who have shared their tips and experience for preparing their dogs for babies. Today, Maggie Marton, the blogger behind Oh My Dog!, is sharing her family’s experience with their baby, Violet, who joined their family last year. For all my posts in this series, click here. 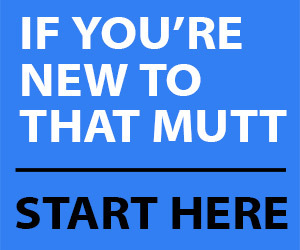 That Mutt: When you thought about your dogs with Violet, were there particular training areas you wanted to focus on? Maggie Marton: Cooper isn’t the most confident guy around, so I wanted to be sure he felt comfortable around all the baby stuff—the rockers, the swing, and anything that made noise. We adopted our daughter, but while we were going through the adoption prep, we started setting up a few baby things here and there to get him accustomed to sights and smells. Overall, it was simply a matter of him getting used to the gear before she arrived. TM: As you prepared your dogs for Violet, was there anything that surprised you or any behaviours or reactions you didn’t expect from your dogs? Maggie: We didn’t actually have any time to prepare Coop for her arrival! We adopted Violet, and we got the call that her birth mom was in labor… and four hours later we were holding our beautiful baby girl! Once she arrived, though, the thing that surprised me the most—especially considering his lack of confidence—was how he immediately took to her. TM: What things did you do that were the most helpful for your dogs? Maggie: The most helpful thing, and what I tell absolutely everyone, is to keep their routine exactly the same. When Violet was born, our elderly dog, Emmett, was declining. He passed away shortly thereafter, but for him and for high-energy Cooper, we made sure that they were fed the same as always, walked the same as always, cuddled and played with, and—most importantly for Cooper—tucked into bed with us like always. We didn’t want either dog to feel displaced, even if it meant asking a friend or family member to sit with the baby so that we could walk them around the block. TM: What are your top tips for pet parents who are expecting a human addition? Maggie: Don’t expect more from your dog than is reasonable or that they’re capable of. 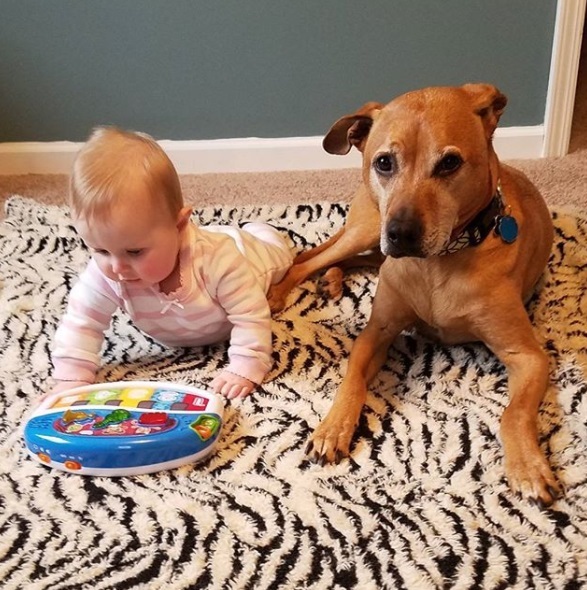 Your dog won’t inherently know how to behave around a baby. Your job as the parent to both the pet and the human is to keep them both safe, healthy and happy. What that looks like will be different for every family. Some dogs, like Coop, take to the role right away. Others may have to have different boundaries set up (like baby gates, a mat, etc.) to keep both babes safe. And, it almost goes without saying, no matter how good your dog is, never leave your pup alone, unattended with your baby. Ever. For any reason. Even if that means holding your infant while you pee. It’s heartbreaking when accidents happen because the dog always pays the price, so approach every interaction with an abundance of caution. TM: Is there anything else you’d like to add? Maggie: Don’t worry about barking! Babies have heard it throughout their entire time in the womb, and even in our case from day one a little bit of barking just sort of absorbs into the background. Now, at 9 months old, she can stay sound asleep, napping like a little angel, even if the doorbell rings and Coop goes bonkers just because she’s so used to it. Same goes for running the vacuum, blender, etc. It’s like conditioning your dogs! 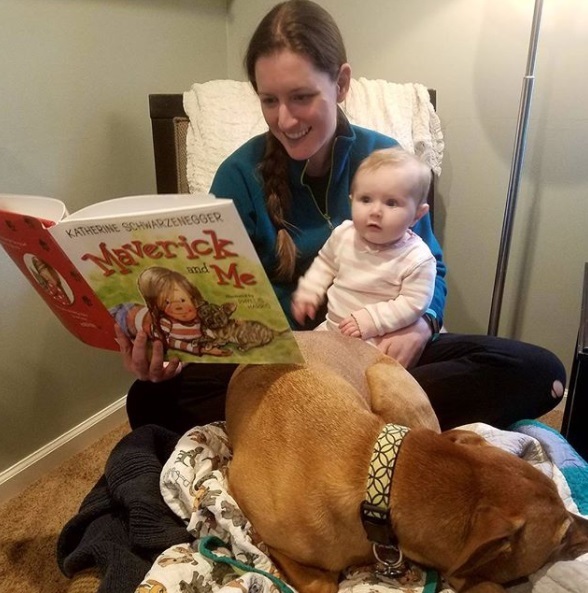 You can read more about Maggie and her herd at Oh My Dog! Julia Thomson maintains the blog Home on 129 Acres where she writes about her adventures of country living and DIY renovating. She and her husband live on a 129-acre farm in Ontario, Canada. Follow Julia on Twitter here and Instagram here. Thank you so much for sharing our story and experience! We’re so grateful! I appreciate you being part of this series. I particularly appreciate you saying never leave your dog and baby unattended. No matter how much we love and trust our animals I think it’s always important to monitor them with small, unpredictable humans.